Group portrait of the officers of the 1st Battalion at Meteren. Left to right, back row: Lieutenant (Lt) K. C. Mortlock MC: Lt Robert D. Humphreys MM (killed in action 16 April 1918); Lt F. A. Presnell; Lt T. J. Richards MC; Captain (Capt) Chaplain Redmond; Lt W. H. Parkinson; Lt R. H. Jensen; Lt A. J. H. Stobo. Middle row: Lt F. P. Shannon; Lt C. J. Waugh; Lt G. Bitmead; Lt F. W. Wells; Lt A. T. H. Brownlie; Lt H. H. Davis MC; Lt R. W. Sampson MC; Lt B. W. Champion; Lt C. A. Clark; Lt C. R. Morley MC; Lt D. J. Burrin (killed in action 23 August 1918). 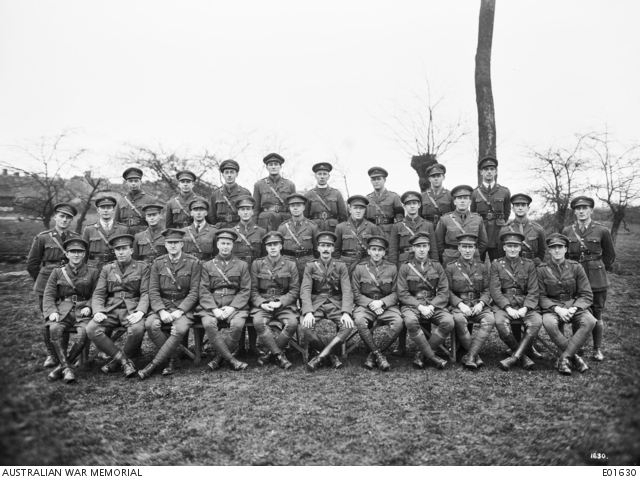 Front row: Capt P. O’Shea MC; Lt F. A. Graham; Capt W. L. Walker; Capt R. J. Forrest MC; Capt C. B. Withy MC; Lieutenant Colonel B. V. Stacy CMG DSO; Lt H. Broadman; Lt A. E. Symons; Lt H. E. a’Beckett MC; Capt J. C. Bootle; Lt F. Griffiths. 1918.